Every family has a north star: Family healing and recovery. Topic: This contribution describes a personal recovery journey and the creation of an organization focused on rebuilding relationships between members of families living with a parent(s) with psychiatric disabilities. Purpose: Adults living with serious mental illnesses have the same hopes and dreams of being successful and resourceful parents to their children and contributing family members as other parents. Specific suggestions highlight ways in which mental health and psychiatric rehabilitation practitioners can support and promote recovery for families. Sources Used: Personal data and resource information available on the Child and Family Connections website located at childfamilyconnections.org. Conclusions and Implications for Practice: Practical guidelines are offered to engage and work with parents living with mental illnesses. Improving our understanding and capacity to better meet the needs of parents with psychiatric disabilities will more likely enhance their roles as parents. Developing the evidence base for families living with parental psychiatric disabilities: Crossing the bridge while we’re building it. Nicholson, Joanne; Friesen, Barbara J. Recovery in a family context: Experiences of mothers with serious mental illnesses. Carpenter-Song, Elizabeth A.; Holcombe, Billy D.; Torrey, John; Hipolito, Maria Mananita S.; Peterson, Loretta D.
“It’s not that straightforward”: When family support is challenging for mothers living with mental illness. Context and opportunity: Multiple perspectives on parenting by women with a severe mental illness. Mental health consumer parents’ recommendations for designing psychoeducation interventions for their minor children. Parenthood and severe mental illness: Relationships with recovery. Bonfils, Kelsey A.; Adams, Erin L.; Firmin, Ruth L.; White, Laura M.; Salyers, Michelle P.
Availability of services for parents living with mental disorders: A province-wide survey. Implementing an intervention for parents with mental illness: Building workforce capacity. Preventive family service coordination for parents with a mental illness in the Netherlands. 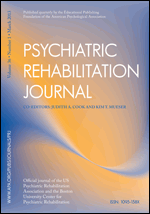 Wansink, Henny J.; Hosman, Clemens M. H.; Janssens, Jan M. A. M.; Hoencamp, Erik; Willems, Willemien J. C. T.
Assessing an Internet-based parenting intervention for mothers with a serious mental illness: A randomized controlled trial. Outcomes of programs serving mothers with psychiatric disabilities and their young children: A multisite case file abstraction study. Cook, Judith A.; Steigman, Pamela J.; Jonikas, Jessica A.
Assertive community treatment for parents with serious mental illnesses: A comparison of “parent-sensitive” assertive community treatment teams versus other teams. White, Laura M.; McGrew, John H.; Salyers, Michelle P.; Firmin, Ruth L.
Working with and for parents to create a Family Focus DVD.